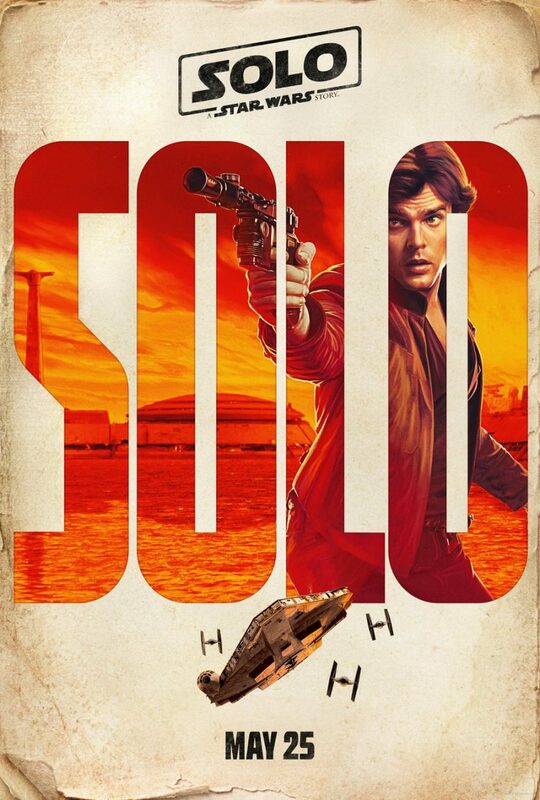 Firstly, I have to admit that this review will be somewhat tainted by the event of my viewing it, which I think is relevant to the following thoughts on Solo: A Star Wars Story. So, as Dickens once said, to begin at the beginning. Every midnight opening for the new Star Wars films (of which there have now been four, including last night’s) have been packed affairs, with many fans going as far as cosplaying to create an atmosphere appropriate for the realest of such a well loved juggernaut of a franchise. But, not this one. Other than one solitary person myself and my daughter were the only other people watching the film. Talk about weird and somewhat creepy too. Does this bode badly for a film already tainted by bad press from the very public sacking of original directors, Phil Lord and Chris Miller, as well as reports from set that Alden Ehrenreich, the young Han Solo, wasn’t up to the part and acting coached had to be brought in? Hell, the first trailer that was released didn’t help either. Were the odds already stacked against them early, I wonder? But then, thing started to improve. A second higher octane trailer emerged, along with reassurances that replacement Ron Howard signalled that the film was in safe hands. And it was. But, try laughing at the humour – of which there is much, as seen from the second trailer – when there’s no-one else there. As a result, a lot of the jokes fell flat. I am undecided until I get to watch it a second time – and with more people one would hope – whether this is a fair representation of the situation and the humour, or whether the jokes do indeed land badly. The one thing I can say that could well lean me towards the latter assumption is that the timing of some of Han’s one-liners and retorts in the trailer were far better timed than the execution in the film. But, I’ll let you decide. That’s if you go at all. Which I do recommend you do if you’re a fan. If not; I suspect you won’t have an interest in a character only your mum and dad cared for, 40 years ago now! As a fan, it is a good enough crowd pleaser. But, you do wonder which came first, the checklist of integral, fan-pleasing event that demanded answering (and, yes, the infamous Kessel Run is included, as is Han’s first meeting with Chewie and Lando) or the plot? But, with The Empire Strikes Back writer, Lawrence Kasdan (along with son, Johnathan here), on writing duties , it was always going to feel like a Star Wars film. It certainly looks like one. Although the heist story and subsequent fallout when it goes wrong could have been transposed in any number of other films. But, hey, I like heist films. And, by the end of this instalment, I liked Enrenreich as Han too. It’a story of lost and found love, untrustworthy double-crosses and the odd surprise too. No more so than in the last act when a very surprising characters appears, completely out of left field and with no proper explanation other than as a teaser for more to come from said character. A characters that, to me, screams out to fans that the rumours of a Ben Kenobi film are probably much more than that. And one that further links the extended universes stuff, like the recent Rebels cartoon series. And, that’s all the clues I’ll divulge on this particular turn up for the books. 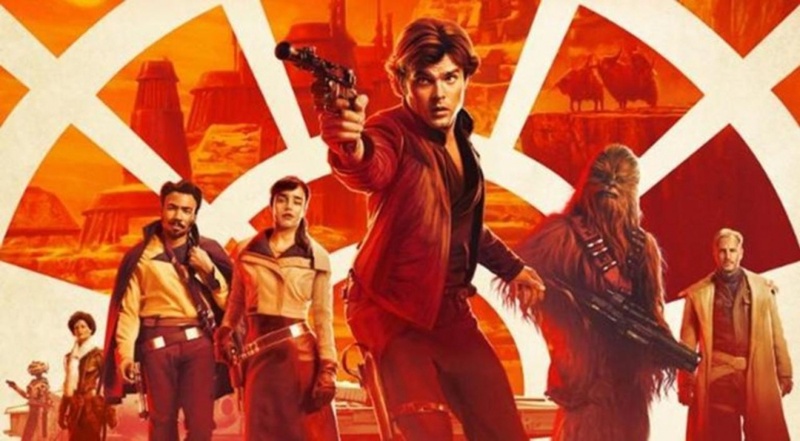 Add to that a might fine cast of actors – to which the less experienced Enrenreich has to work with – and you’ve got a great summer heist movie that digs deeper into the Han Solo we all know and love and even gives nods, here and there, to the previous origins of Solo and Chewie as told in past Star Wars novels, comics and so forth. And, Enrenreich does hold his own. 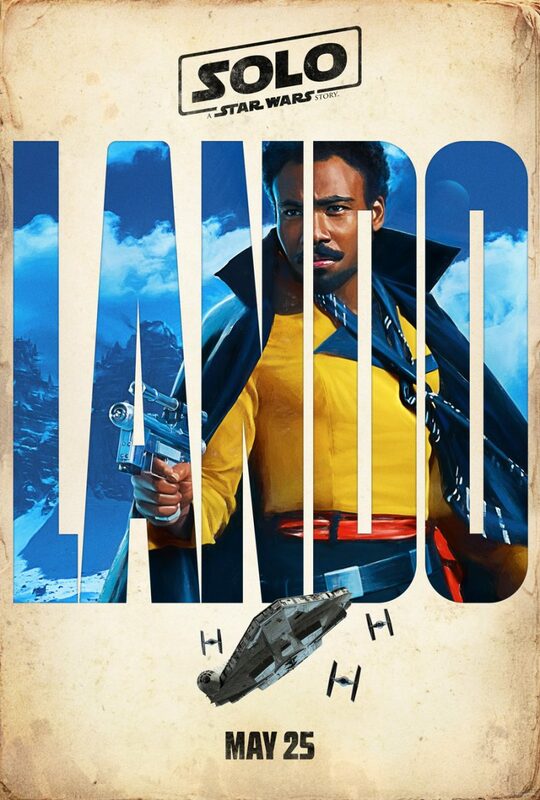 Both him and Donald Glover who has Lando’s speech patterns down to a tee, as well as a love of capes that’s a running joke throughout the film. Glover oozes charm, and makes Lando just the right kinda sleazy. The guy who would stab you in the back, cheat and steal, but bad in business deals, as we learnt from The Empire Strikes Back and his deal with the Empire. But, how much any of this backstory building film will matter to the new generation of fans, purposefully being brought up with newbies Finn, Rey and Kylo Ren, only time will tell. And, box-office takings. And so, I come full circle. This is a movie that could easily flop, if my experience on opening night was any indication. And, jammed in straight after even bigger draws, like Avengers: Infinity Wars, and Black Panther before that, maybe it could be a question of bad word of mouth, bad timing, and characters that younger film goers find irrelevant. I certainly hope not because while it’s not the greatest of films in the Star Wars canon, it certainly ain’t the worst, and offers up a glimmer of the hero Han is destined to become, even if he doesn’t yet believe it himself. But, I must admit, I have a bad feeling about this, nonetheless.